On a 6-4 vote, members of the Missoula City Council on Wednesday approved a pedestrian access plan for a proposed South Hills development, moving the project one step closer to a final vote. The issue of trails versus pathways and where to place them has, in part, kept Hillview Crossing before the City Council’s Land Use and Planning Committee for several months. And while the debate isn’t finished, Wednesday’s vote cleared a significant hurdle. 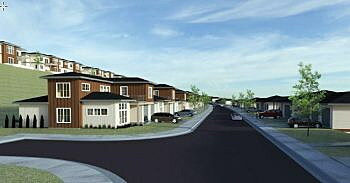 The project, proposed by Hillview Crossing LLC, would create 68 townhomes in 34 units in an empty field off Hillview Way. The area is surrounded by other homes and subdivisions, also built on the valley hillside. But the Hillview Crossing proposal has raised concerns with some over potential runoff, emergency access and its design, which includes blocks that exceed the city’s preferred 480-foot length. The council has spent several weeks looking for ways to shorten the blocks while also acknowledging the site’s challenging topography. Anderson proposed a condition that would require two pathways placed through the heart of the project, essentially shortening the distance one would have to walk to reach their destination. But it also could have impacted the project by reducing the number of units the developers could build, which could have impacted the overall financing. In a move for compromise, the developers presented a competing option that also addressed connectivity and access, though not to everyone’s standards. In the end, it passed on a 6-4 vote. “There isn’t a perfect solution here, but I think the solution proposed in this design gets us close enough to be acceptable,” said council member Bryan von Lossburg. Council member Michelle Cares agreed. Council member John DiBari disagreed. Holding it for another meeting will leave the project in limbo for what will mark six months. The next hearing on the issue is scheduled for May.